If you’re over 50, you’ve maybe realized your physical balance isn’t quite as good lately as it was when you were younger. This might occur by experiencing dizziness from time to time, or not being able to maintain balance while walking in precarious places. This can obviously become concerning, especially if you’ve almost taken a few spills as a result. Perhaps you’ve already experienced some falls over the last few years or months, most of which didn’t harm you severely. However, what would happen if you ended up in a more severe fall? This could bring major head trauma and a concussion. Or, you could end up with physical injuries you never recover from. Any signs of balance problems should become an immediate red flag for you and your family. The solution is to take some action doing physical therapy. Don’t automatically think this means overly strenuous activities you can’t realistically do. When it comes to physical therapy, you don’t have to start doing exercises like an Olympic athlete. Many practical tips exist you can do in a slow and careful manner to improve your balance within weeks or months. Before you start, it’s worth looking at these five facts on balance and falling to give you an idea of how serious it’s become for people in your age group. As Prevention notes, far too many older people don’t pay enough attention to their physical balance, despite noticing slight physical signs. You may write it off as natural clumsiness if you’ve had a few minor falls when out hiking or climbing stairs. The thing is, even normally agile people have to work on their balance, because it can start to decline as you age. Balance is actually a separate system, just like strength and flexibility. If you already work on those latter two, it’s important to integrate balance therapy. Statistics show one-third of all people over the age of 65 end up having a fall at least once. This increases to one-half of all people aged 80 or more. In all cases, these falls lead to serious injuries like lacerations, hip fractures, or head trauma. If you’ve already had this happen, you need to take action now. This is because if you’ve fallen once, you’re two to three times more apt to have it happen again. Consider that if you’re dealing with a balance disorder, it could lead to more than just falling. It could result in perpetual fatigue, or general disinterest in living an independent lifestyle. When you can’t walk steadily, you’re already eliminating many life activities while ruining any desire for leisure. Just chalking this up to normal aging isn’t right, because balance problems aren’t natural. According to the National Council on Aging, an older adult dies from fall injuries every 19 minutes in America. This stunning statistic shows how often falls occur, and treatment for them happens every 11 seconds somewhere in the nation. This equals out to 27,000 deaths from falls per year, not including 2.8 million fall injuries treated in emergency rooms annually. The NCOA above also reports costs from fall injuries were up to $34 billion per year as of 2013. You can only imagine it’s exceeded this figure somewhat once new statistics are released. With health care costs already rising, this places a great burden on our healthcare system. Through these facts, you see why you need to take action on physical therapy if you’re noticing daily balance problems. Here’s some practical therapy steps you can use to start helping your balance issues immediately. There isn’t any more practical physical therapy technique for helping balance than standing on one leg for a prolonged period. Once you start doing physical therapy with a professional, this is one of the first exercises you’ll do. Obviously, this should take place first with someone by your side in case you lose your balance. All it entails is to simply stand up, close your eyes, and lift one leg up. You need to hold this for 10 to 15 seconds to help improve your balance. Numerous variations exist on this classic exercise. The “Yoga Tree” places your raised leg against the thigh of your standing leg. Another called the Taiji Stance has you place your arms in a blocking position while doing the leg stand. Overall, doing any of these regularly improves your stability and balance. It’s possible you’ll find doing squats a little easier on first try than the one-leg stand. Building quads in your legs helps give you more strength in your legs to break falls if you start to lose your balance at home or elsewhere. All you need to do is set your feet hip-width apart, bend your knees and hips, then slowly lower yourself. Be sure to keep your arms straight out and your back as straight as possible. Stop the squat as soon as your thighs are parallel with the floor. While the above exercises are very basic, you need to start slow. 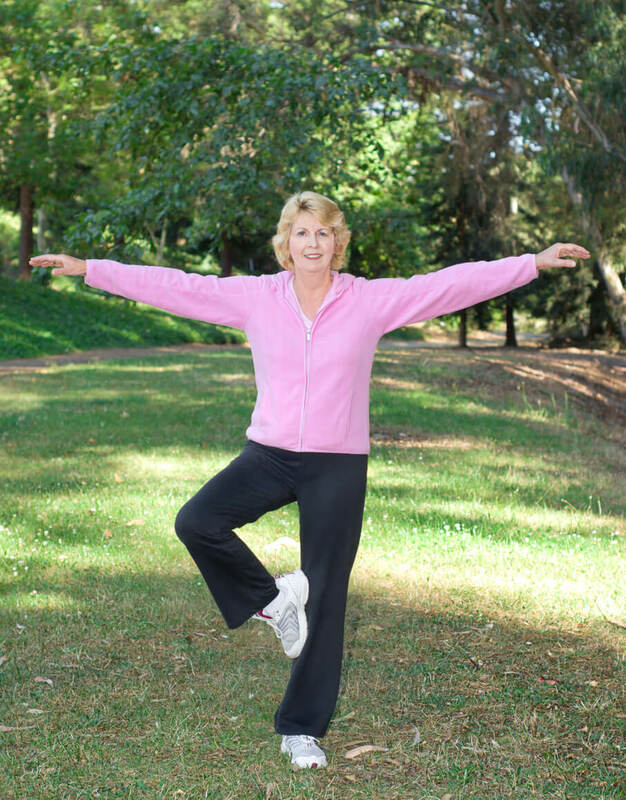 After more vigorous physical therapy later, you can test your balance while standing. Just stand with ankle bones touching and arms folded across your chest. Close your eyes and stand in place for a minute without moving. Gradually move one foot in front of the other while keeping your eyes closed. Staying mostly in place during this proves to you how valuable your physical therapy is, giving you incentive to keep it going indefinitely. Visit us at Orthopedic and Balance Therapy Specialists to learn about our superior physical therapy techniques for eliminating balance issues, as well as debilitating pain. Most importantly, I will show you a sure fire way to pick the right treatment for the cause of your condition. Click here to register for the Valparaiso Balance and Dizziness Workshop. Click here to register for the Crown Point Balance and Dizziness Workshop.